699 Bourke Street is the first commercial building to be designed by Grimshaw in Melbourne. 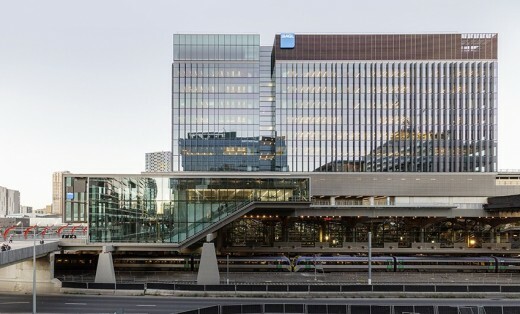 Situated above the rail environment of Southern Cross Station, the building is the new Victorian office of AGL Energy Limited (AGL) and offers an exceptional workplace environment to its 1500 employees. 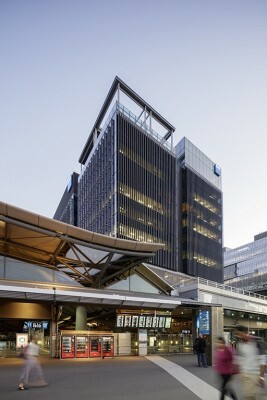 Grimshaw worked closely with the developers of the building, Mirvac, and major tenants, AGL, to deliver an A-Grade office space that is designed to take best advantage of the unique over-rail air-rights site. Construction over rail is becoming more common as Melbourne densifies, presenting tough design and technical challenges. In a typical building construction, basements and footings allow for flexibility in the location of structure and a place to hide bulky plant equipment and services. 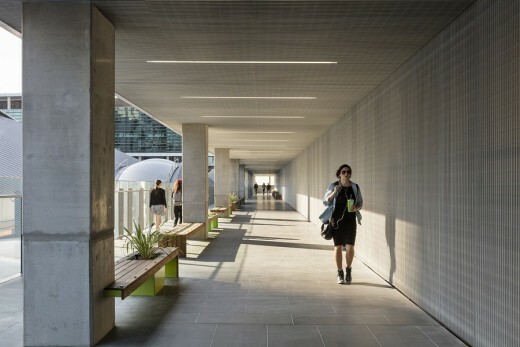 When building in the air, a new ground plane needs to be constructed and this was done for 699 Bourke Street, with 2m-deep concrete-filled beams that span 20m between supports. Aligned with the western edge of the existing Southern Cross Station roof, this ground plane sits 24m above the train tracks and is the lowest occupied level of 699 Bourke Street. All of the basic services, such as electricity and water, need to rise to this level to enter the plant equipment rooms. A benefit of overcoming the technical issues is foremost the improved views and daylight; 90% of the office floor is within 12m of the high-performance glazed façade, surpassing a key requirement of the 6 Star Green Star office ratings. Excellent views can be obtained at all levels, with views of the undulating Southern Cross Station roof and Melbourne’s Central Business District (CBD) to the east, Mount Macedon to the north and Port Philip Bay to the south. 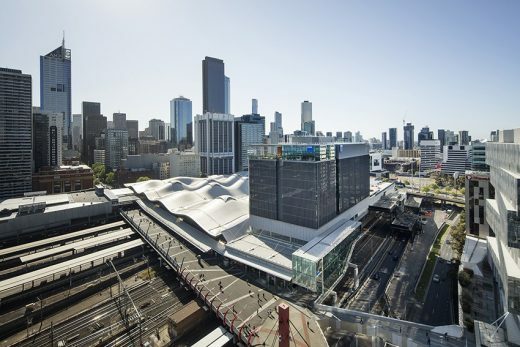 Conceived as part of the Southern Cross Station Master Plan designed by Grimshaw in association with Jackson Architecture, 699 Bourke Street forms a considered backdrop to the roof of the station while providing a strategic connection between Melbourne’s CBD and the Docklands precinct. With more than 275 bike racks and 360 lockers, the end-of-trip facilities set a new benchmark in Australia for quality and amenity. 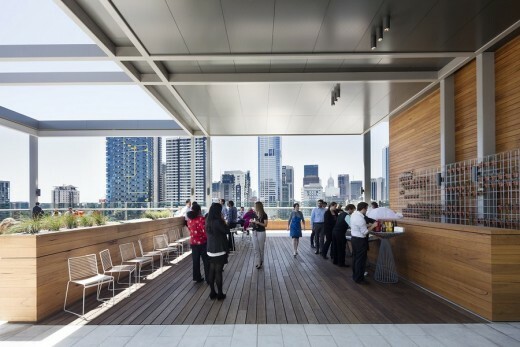 “The building features premium services, a 360 panel solar farm supplying 90kW of electricity (the largest solar power system on a commercial office building in Melbourne), and over 19,000sqm of net office space across nine floors. Its coming to life is a very proud moment for Mirvac. 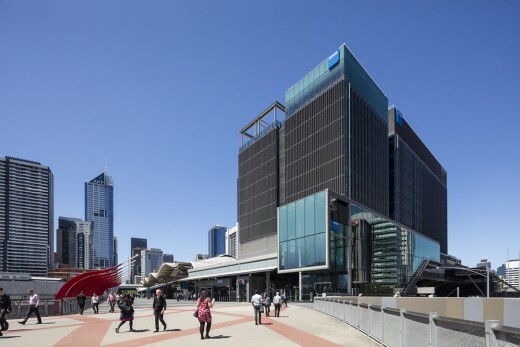 We are proud of our partnership with AGL and that we have been able to realise another world-class workplace at the heart of Melbourne,” said Mr Rolls. 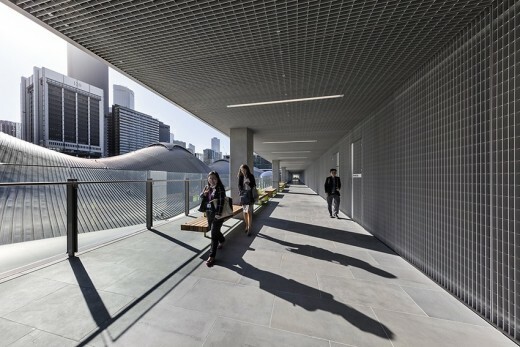 A key feature of 699 Bourke Street is the design of the building’s north façade which prevents glare reflectivity on to the rail yard environment below, mitigating risk to train drivers. To achieve this, Grimshaw led a detailed solar analysis to determine the solar angles and devised an integrated fixed-louvre screen which maintains views while preventing reflections. These louvres are an identifying feature of the north façade, a precise and layered surface which diffuses light. The main address of the building is the Bourke Street Bridge which provides pedestrian access between the CBD and Docklands. To help identify the entrance and negotiate the 8m rise to the lowest lobby level of 699, Grimshaw designed a glazed pavilion that accommodates stairs and escalators, and which is delicately supported at only two points over the rail below. The foyer leads to the AGL lobby and Business Lounge and is designed to embrace its position in the sky by utilising light-weight, reflective materials such as glass and stainless steel. From the lobby, an open-air public walkway provides a pedestrian laneway that connects Bourke Street Bridge and Collins Street at number 664. 699 Bourke Street was officially opened in 2015 by the Minister for Energy, Hon Lily D’Ambrosio. Grimshaw was appointed to work in collaboration with Jackson Architecture on the reorganisation and expansion of Southern Cross Station. 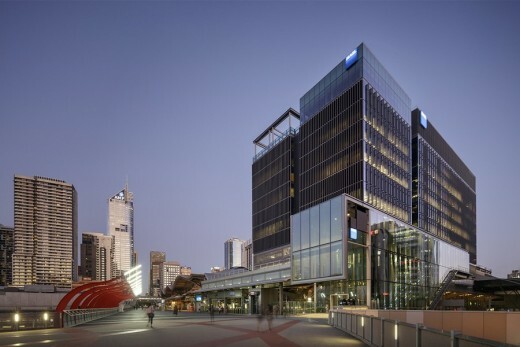 As well as the transport interchange and associated track and signalling works, the redevelopment includes a major office building on Collins Street and a retail plaza serving the Central Business District’s west end. The key generators for the station’s design were practical performance, ease of passenger circulation and an improved working environment for staff with sheltered, high-quality ticketing, baggage-handling and waiting services. These are all equipped with comfortable seating, lighting and passenger information display systems. The design focus of Southern Cross Station is the dune-like roof that covers an entire city block. The roof’s form plays a crucial role as part of the environmental envelope, ensuring that it is a symbol of sustainable architecture developed in response to the hot external climate and the internal need for diesel extraction and ambient cooling via natural ventilation.